First conference of Fr. Bernadino Guiseppe Bucci, O.F.M. Second conference of Fr. Bernardino Guiseppe Bucci, O.F.M. 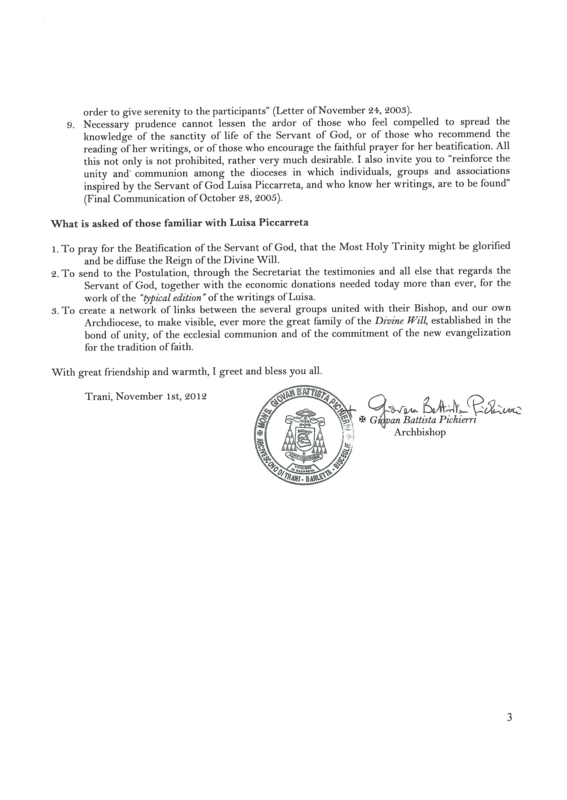 Third conference of Fr. Bernardino Guiseppe Bucci, O.F.M. Passages on Luisa being born twice. and is it important to know her? The following is intended to aid the journey to opening ever more to “the One who is capable”. With that, know that the long story of God’s Will is the beginning, the means and the end of human purpose, and little Luisa, whom Jesus calls the little daughter of the Divine Will, is necessary to this story. Luisa is known best without attachment to other causes. The writings of The Servant of God, Luisa Piccarreta are the exclusive property of the Archdiocese of Trani (letter to Bishops of October 14, 2006) and because of the delicacy of the current phase of the proceedings of the Sacred Congregation of the Causes of the Saints, and to be in complete obedience to Archbishop Pichierri (November 1, 2012), the writings of The Servant of God, Luisa Piccarreta will temporarily be suspended on this website until further notice. The writings of The Servant of God, Luisa Piccarreta are not against any moral or dogmatic truths of the Church. 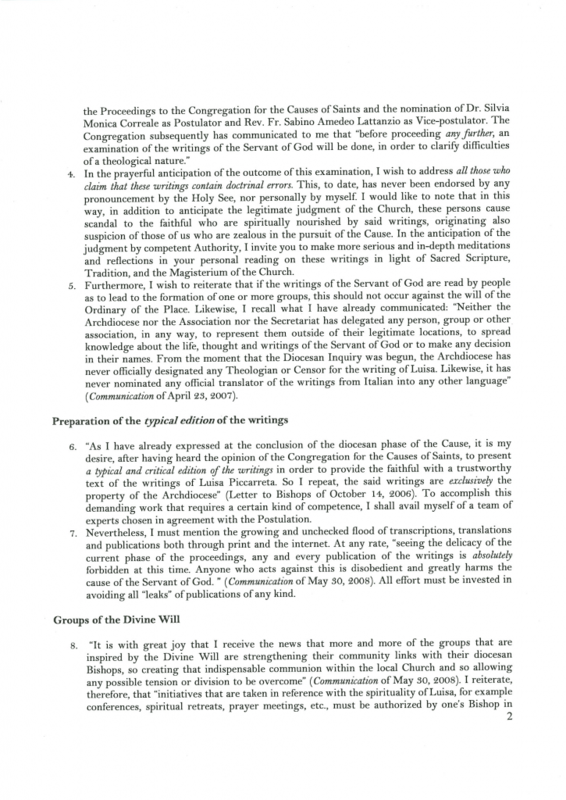 This web site is in obedience to Archbishop Pichierri and joyfully awaits Holy Mother Church to proclaim The Servant of God Luisa Piccarreta, Venerable. This web site began out of a fervent zeal for The Servant of God, her spirituality and holiness. Please enjoy the rest of the site. Luisa Piccarreta was born in Corato, province of Bari, Italy on April 23, 1865. She was baptized in the Mother Church and there received the first Sacraments in 1874. When she was 11 she became a “Daughter of Mary” and as a teenager a third-order Dominican. She received only a first grade education, and was called to serve our Lord as a victim soul at the tender age of 16. On February 2, 1899, she was given the obedience by her spiritual director to begin a diary of her spiritual experiences, which she continued until 1938: 36 notebooks which detail her intimate rapport with heaven. In 1926 she wrote her autobiography under obedience to her extraordinary spiritual director and Censor of her Writings, Saint Annibale Maria Di Francia. Her bed was her cell, her room her chapel, and her bed her Cross. The word which gave her life was God’s own creative Word: Fiat! When she spoke, it was only briefly, but very wisely; the example and counsel she gave was always illuminating. Carrying invisibly the wounds of our Lord in her own crucified body made her a rare victim of intercession for mankind for more than 60 years, and any physical illness. Her nourishment for the most part of her life consisted of God’s Most Holy Will and the Eucharist. 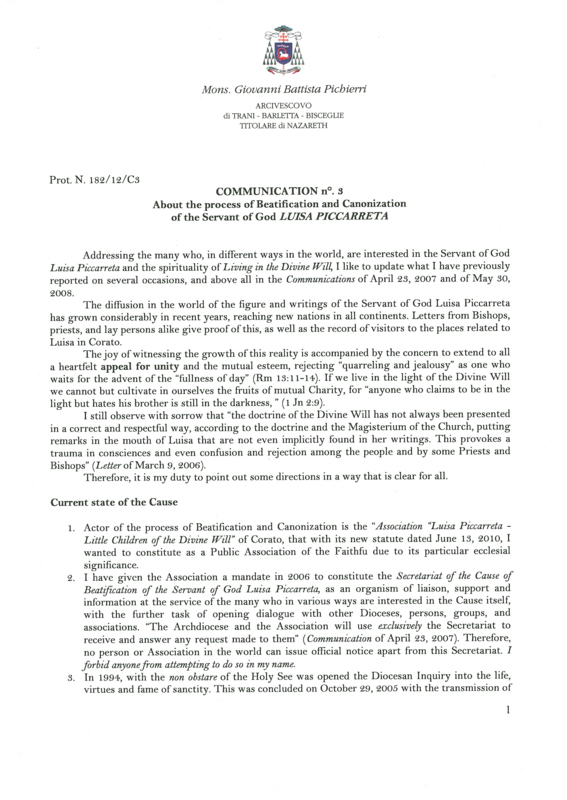 Luisa, Precursor of the Sanctifying Third Fiat, chosen by God for the holy mission of proclaiming God’s Kingdom: “His Will now done on earth as it is in heaven”, was called into the fullness of that Kingdom on March 4, 1947. On November 20, 1994 in the Mother Church of Corato, Mons. Carmelo Cassati, Archbishop of Trani-Barletta-Bisceglie, having received the “non obstare” from the Holy See, blessed the opening of the Cause of Beatification and Canonization of the Servant of God Luisa Piccarreta, secular third order Dominican. With the Archbishop himself as president of the Ecclesiastical Tribunal, joined by enthusiastic faithful from southern Italy and from around the world, Luisa began her triumphal journey toward the Honors of the Altar. 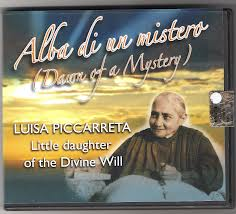 This video on the Servant of God Luisa Piccarreta, Little daughter of the Divine Will, was published by the “Pia Associazione Luisa Piccarreta P.F.D.V.” and offers an insight into the life and times of Luisa, the little daughter of the Divine Will. It was filmed in the places she lived including her last home and includes images of her funeral. Through interviews you can learn about the important events in her life, and hear excerpts from some of the 14 thousand pages of her inspired words. We pray that this video can bring back some hope to a world that needs it, a hope that we can all live in the Divine Will. (from “Pia Associazione Luisa Piccarreta P.F.D.V. , Corato (Bari) – Italy – copyright 2005 – all rights reserved). From Giovanni Battista Pichierri, Archbishop – concerning the Cause of the Servant of God Luisa Piccarreta (Spanish and Italian can be found on subsequent pages). Oh Most Holy Trinity, Father, Son, and Holy Spirit we praise and thank You for the gift of holiness You granted to Your faithful servant LUISA PICCARRETA. She lived, dear Father, in Your Divine Will and became, under the influence of the Holy Spirit, similar to Your Son, who died on the cross due to His obedience. She was a victim and a host welcome to You, thus contributing to the Redemption of mankind. We appeal to her merits to obtain from You, Holy Trinity, the particular grace for which we pray to You in Your Divine Will. Amen. Our Lady, Queen of Saints, pray for us. O Most Holy Trinity, Our Lord Jesus Christ taught us that as we pray, we should ask that our Father’s Name be always glorified, that His Will be done on earth, and that His Kingdom should come to reign among us. In our great desire to make known this Kingdom of love, justice, and peace, we humbly ask that You glorify Your Servant, LUISA PICCARRETA, the little daughter of the Divine Will, who, with her constant prayer and suffering, deeply yearned for the salvation of souls and the coming of God’s Kingdom in the world. Following her example, we pray to You, Father, Son, and Holy Spirit, to help us joyously embrace the crosses of this world, so that we may also glorify Your Name and enter into the Kingdom of Your Will. Amen. I. O Most Sacred Heart of my Jesus, who chose your humble Servant LUISA as the herald of the Kingdom of your Divine Will and the angel of reparation for the countless sins that grieve your Divine Heart, I humbly pray you to grant me the grace that through her intercession I implore of your Mercy, so that she may be glorified on earth as you have rewarded her in Heaven. Amen Our Father, Hail Mary, Glory be. II. O Divine Heart of my Jesus who gave to your humble Servant LUISA as a victim of your Love the strength to suffer all her life the spasms of your painful Passion, grant that for your greatest glory the halo of the blesseds may shine around her head. And through her intercession grant me the grace that I humbly implore of you… Our Father, Hail Mary, Glory be. III. O Merciful Heart of my Jesus who, for the salvation and sanctification of so many souls, deigned to preserve for long years on earth your humble Servant LUISA, your little Daughter of the Divine Will, hear my prayer: that she may be glorified by your holy Church without delay. And through her intercession, grant me the grace that I humbly beseech of you… Our Father, Hail Mary, Glory be. + ARCHBISHOP REGINALDO ADDAZI, O.P. Prayer on the holy picture (with relic) printed immediately after Luisa Piccarreta’s death with the authorization of Archbishop Reginaldo Addazi O.P. Sure that Our Lord reward you with His spiritual graces we thank you for your generosity. VATICAN CITY, January 31, 2014 – Losing the sense of sin causes others to pay for our “Christian mediocrity.” This was the central point of Pope Francis’ homily today at Casa Santa Marta. The Holy Father reflected today on the first reading which spoke of David’s sin of adultery with Bathsheba which led to the murder of her husband, Uriah. David, he said, rather than seeing his adultery as a grave sin, sees it as a problem that needs to be resolved. Referring to Pius XII’s assertion that “the sin of the century is the loss of the sense of sin”, the Pope reflected on Uriah, who represents the innocent victims who suffer as consequence of our sins. “I must confess, when I see these injustices, this human pride, also when I see the danger that would happen to me, the danger of losing the sense of sin, it does me well to think of the many Uriahs in history, the many Uriahs who even today suffer from our Christian mediocrity, when we lose the sense of sin, when we let the Kingdom of God fall.